Includes all children’s favourite Christmas carols; “Once in Royal David’s City”, “O Little Town of Bethlehem” and “We wish you a Merry Christmas”. 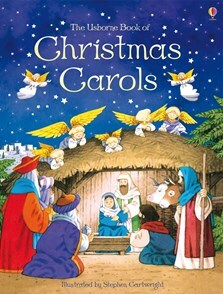 The Carols are accompanied by colourful illustrations by Stephen Cartwright, making this a great-value carol book. Listen, or sing-along to the tunes at the Usborne Quicklinks Website. I want to commend Usborne for their good work. It has been an inspiration to me and my music class. All I want to say is keep on with the good work. I have found this book useful as a teaching aid. Quite a lot of my piano pupils want to be able to play popular carols to a standard, and this is an excellent introduction, because they can then move onto the more difficult books like Carols for Choirs.